...... Three experts of the game Japan Blackjack landed in this town too to insert new additions into the game. 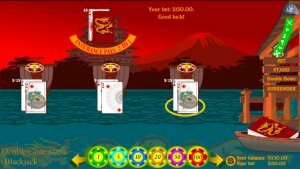 For example, the specialist from the Past specified each point of the classic game rules, the modern graphics, computer technologies, exotic settings, cards style and Japanese music were brought from the Present and the idea of Japanese Blackjack world championship was taken from the Future. And the game is a result of these parts unification. The game starts right now in the building you see in front of you. We invite you in the world of our game, take part in the championship and if you win the volcano would erupt in honor of you. Japanese Blackjack has all the features of a real life Black Jack game and it has special characteristics you are to know. It is sharp graphics, unusual scenery and simple rules. Qweas is providing links to Japanese Blackjack 1.0 as a courtesy, and makes no representations regarding Japanese Blackjack or any other applications or any information related thereto. Any questions, complaints or claims regarding this application Japanese Blackjack 1.0 must be directed to the appropriate software vendor. You may click the publisher link of Japanese Blackjack on the top of this page to get more details about the vendor.